WinMetro provides Windows 8 transformation pack for Windows 7, Vista, and XP. It is a handy software to enjoy Windows 8 user interface on your current Operating system without changing any settings. It not actually transforms your current Windows to Windows 8, rather it provide its own interface having Windows 8 start screen, which looks really cool. Even more, you can switch to original desktop in a single click also. 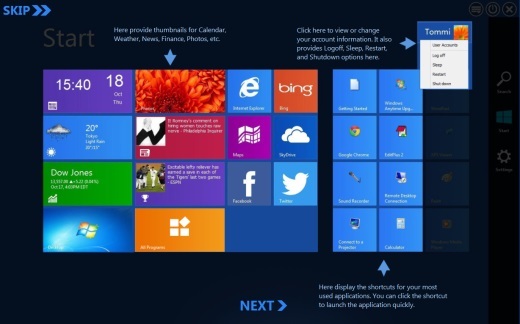 Once installed, WinMetro will provide you home screen (or welcome screen) of Windows 8, just like visible in screenshot below. Using WinMetro, you can easily access photos tile, Internet Explorer, Google Maps, stock updates, your SkyDrive, Facebook, Twitter account, etc., just like it is happened in original Windows 8. WinMetro works absolutely fine and there is no threat associated with it. I tested it on Windows 7 with no errors, so you can use it without any worry, and completely free. 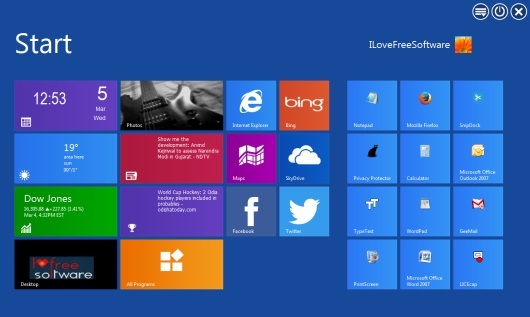 We have covered some free websites to download Windows 8 themes. How To Use This Free Windows 8 Transformation Pack Software? WinMetro installs, like other software, and lets you get the feel of Windows 8 on your current Windows. Setup file of WinMetro is 7.38 MB in size, and you can use link available at the end to download it. After completing the installation, it will provide desktop icon as well as taskbar icon to launch it. While using it for the first time, it provides introduction wizard, so that you can understand it. 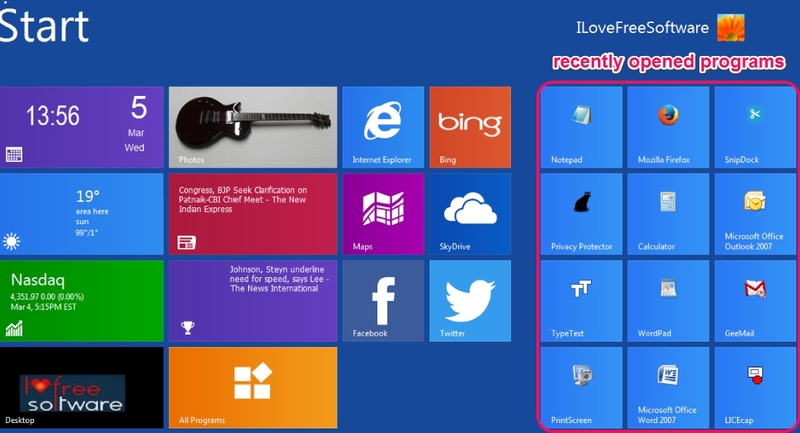 Whenever you will launch WinMetro, it will provide you with a home screen, just like the one present in Windows 8. 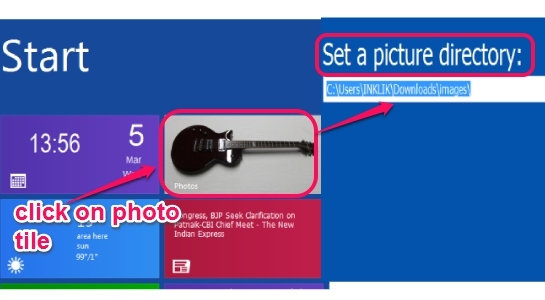 On its home screen, it provides all the recently opened programs as tile on right part. And on the left part, all the information will be displayed. Information like, news/sports highlights, current weather condition, date and time, all programs available on your PC, desktop tile to go back to your desktop screen, photo tile to show you photos of default directory, and more. Photo directory can be customized with your choice as well. Just click on photo tile and access settings to add a photo directory. In the similar way, you can add any company name to view stock quotes in Finance tile. 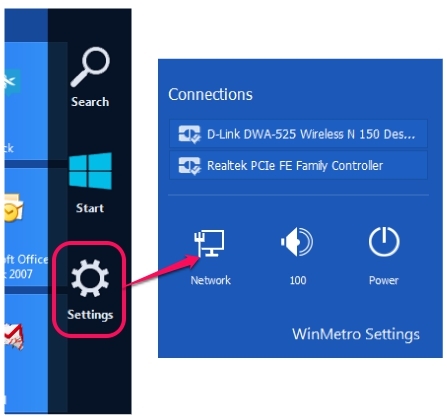 You can also access your desktop screen by moving your mouse cursor to bottom left corner and same thing can be done to open start screen of WinMetro. 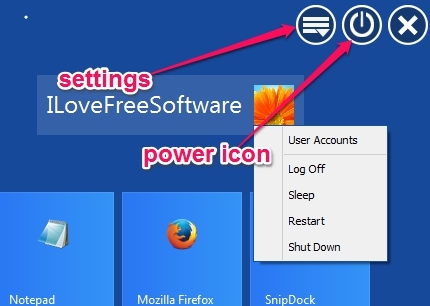 To access settings of WinMetro or to restart/sleep/shutdown your PC, use options present in top right corner on home screen. Your PC account name will also be visible there. Clicking on account name will also help you to use power actions and access user accounts. Sidebar of WinMetro provides options to search for an item (or use hotkey Win+S) available on PC, access Start screen, and use Settings (for network selection option, shutdown PC, and adjust volume). To access Sidebar, just move your mouse cursor to right bottom corner. As you could see, WinMetro provides exact copy of Windows 8 start screen. So it is really beneficial for all those users who want to upgrade to Windows 8 or just want to enjoy Windows 8 Metro User Interface on Windows 7. Also check these free software to get Windows 8 look on Windows 7 covered by us.